Home / Wedding Entertainment is Important! You’ve worked hard planning your reception. You have invested your time and your finances so that your wedding will be exactly what you want. You’re making sure you and your guests will always remember the great time you had. So what is a DJ worth? All they do is play music, right? Well, if that were true, and if the music is what everyone says they remember most, then just that alone would make a good DJ worth what he charged. But the DJ you choose is not just there to play music. The success of your reception relies solely on the DJ’s overall ability. He is the person you’ve chosen that best represents you, your style and your taste. Your photographer and videographer are important, too. But your entertainment helps them create what you see. You may have seen a great video or looked at a wonderful wedding album. Everyone is having a good time! What you are really looking at is what a good DJ can make happen – all the fun and the delicate, intimate moments. That is what The TUNES GUY is worth to you : making your wedding day not just ordinary, but extraordinary! On average, between just 2% and 8% of a reception’s total expenditure is allocated to entertainment. Ironically, the entertainment is responsible for over 75% of the reception itinerary. During wedding planning, Brides say their highest priority is their attire, followed by the reception site and caterer; Entertainment is among the least of their priorities. 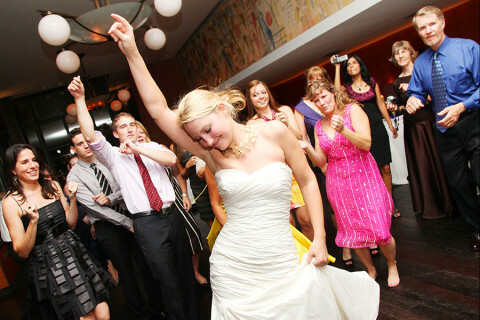 Within one week after their reception, 78% of brides say they would have made the entertainment their highest priority! 65% of all couples that choose a band to entertain at their wedding, say that if they had to do it over again, they would have chosen a disc jockey.